Octinoxate-Avobenzone-Oxybenzone-Zinc Oxide is a nongreasy water-resistant sunscreen gel, which protects your skin from harmful ultraviolet rays that can cause sunburn. It is a broad spectrum photo protective lotion of SPF 50, which nourishes your skin. This is ideal for oily skin and nourishes it. Sunscreens are used to protect the skin from the harmful effects of the sun. They help to prevent sunburn and premature aging (e.g., wrinkles leathery skin). 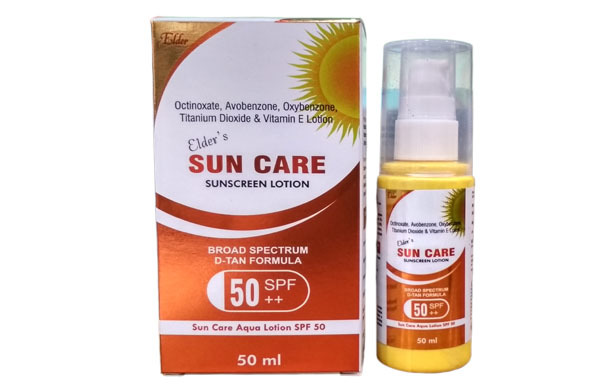 Sunscreens also help to decrease the risk of skin cancer and also of sunburn-like skin reactions (sun sensitivity) caused by some medications (e.g., tetracyclines, sulfa drugs, phenothiazines such as chlorpromazine). Oxybenzone, or benzonephenone-3, is one of the most common chemical filters found in commercial chemical sunscreens. It forms colorless crystals that are readily soluble, and provides UV coverage. Oxybenzone is one of the more popular molecules used by chemists during the manufacturing of cosmetics and is included in sunscreen for UV protection. The chemical is often used to stabilize and strengthen the color and scent of skin care products, but its widest use is in the form of sun block. Unfortunately, the debate about the safety of oxybenzone is still ongoing. One of the biggest concerns in the medical community about the widespread use of the molecule comes from the fact that it's easily absorbed into the body. This absorption raises concerns that oxybenzone may accumulate in the body, eventually leading to potentially toxic levels of the chemical, which can affect the endocrine system. Avobenzone is dibenzoyl methane derivative. It is oil soluble ingredient. Avobenzone has the ability to absorb ultraviolet light over wider range of wavelengths. It is included in many commercially available sunscreens which are used as wide spectrum sunscreens. Avobenzone is very sensitive to light, to increase its stability and duration of action; photostablizers are added in the sunscreen product. Avobenzone has an absorption maximum of 357 nm. Sunscreens containing avobenzone is indicated for providing protection from the sun. In addition to limiting the skin's exposure to the sun, using sunscreen agents may help reduce long-term sun damage such as premature aging of the skin and skin cancer. Oxybenzone, or benzonephenone-3, is one of the most common chemical filters found in commercial chemical sunscreens. It forms colorless crystals that are readily soluble, and provides UV coverage. While the primary function of oxybenzone is to absorb UV light, research has shown that it is also absorbed by the skin and stays in our bodies for an unknown amount of time. Oxybenzone is also used in nail polish, fragrances, hair spray, and cosmetics as a photostabilizer. The topical application of Vitamin E has also proven to be effective in reducing sun-induced skin wrinkling and has excellent skin moisturising properties, also helping to prevent transepidermal water-loss by the skin, thereby increasing the natural moisture content of the skin. Vitamin E is normally found in the skin, but exposure to sunlight has been shown to deplete this extremely important antioxidant and topical application of it boosts the availability of it. Adequate tocopherol levels become increasingly important in mature skin when it has been shown to decrease. Apart from the antioxidant properties, it also helps to moisturise the skin and even more importantly helps with tissue repair, thereby keeping the skin in good condition. Avoid contacts with the eyes and other mucous membranes such as mouth, nose and genital region. Not to be applied to abraded, blistered, inflamed, raw or oozing areas of the skin. Discontinue use if rash, irritation, burning sensation or sensitivity develops/occurs. However, it is considered one of the better tolerated chemical sunscreens but it can still trigger an allergic response in the form of redness and swelling. Most concentrations of this ingredient range from three to five percent when included in a sunscreen, and products with these percentages are usually safe. It is recommended, however, that you keep it out of the eyes and avoid swallowing it.